On Wednesday, Antonio Brown was announced as the official cover athlete for the standard edition of Madden NFL 19. This is by far the longest EA Sports has ever waited to announce the cover athlete of their standard game. We’ve known about Terrell Owens gracing the cover of the Hall of Fame edition for months. Now, it’s time to compare the differences. The standard edition is $60, as if has been for awhile. Buying this version will grant you access to play on August 10th. You can pre-order to receive an elite player from your favorite NFL team and five gold fantasy packs. The Hall of Fame version is now $80, which in addition to three days of early access, you’ll receive seven extra gold team fantasy packs, one elite Hall of Fame legend, one elite cover athlete player (89 overall Antonio Brown), two signature uniforms and one training pack. In Madden Ultimate Team, having a good team is critical and your choices in the pre-order packs will make or break your start to the MUT year. Everyone who pre-orders the Hall of Fame edition receives a team captain, which can be boosted to 90 overall via solo challenges, and a team power-up player. 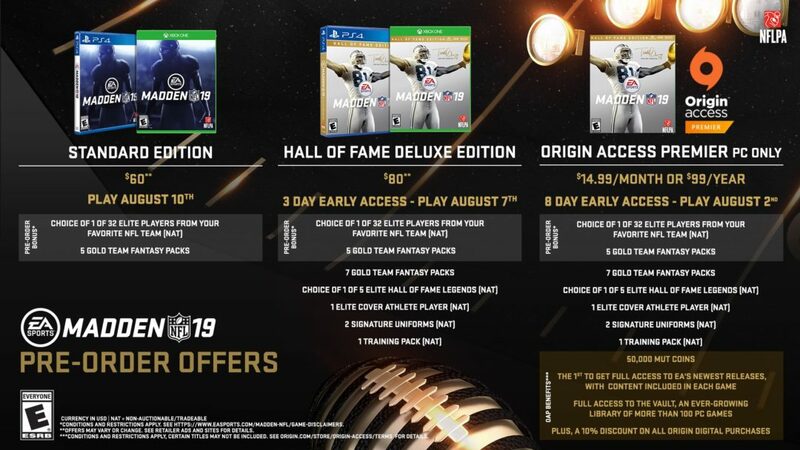 The pre-order bonuses from the Hall of Fame edition can be used in conjunction with your Madden Loyalty Program rewards. Also, be sure to exchange your power-up players in Madden 18 to complete rookie premiere sets to be eligible for the Madden 19 Rookie Premiere Program. All of this combined should get you a competitive MUT team on day one. Additionally, Madden is back on the PC this year for the first time since Madden NFL 08. Origin Access Premier is $14.99 per month or $99 per year. This is a PC only deal, and it grants eight days of early access (playable on August 2). All pre-order bonuses are the same as the console Hall of Fame edition, but OAP subscribers receive 50,000 MUT coins. At the game’s release, that’s a fortune. Below is a full breakdown of the three different versions. To me, the best value is clearly Origin Access Premier. However, Madden has absolutely no footing in the PC gaming world. It’s very unclear if they’ll be able to gain traction this late. If you’re fully committed to the PC, or don’t have a console, it’s a great option. If you play on the console, the Hall of Fame deluxe edition is the better choice, but not for the bonus content. The standard edition will force you to wait three days to play, and thousands of people who pre-ordered the Hall of Fame edition will have a head start. That’s not a crisis, but if you play MUT, the three days of early access is one of the best opportunities to make coins all year. Card prices become heavily inflated as the game is brand new and coins will be easy to make. Get the Hall of Fame edition, open all the pre-order packs and sell whatever you can. Prices for ordinary cards may never be higher. What do you think about the different Madden NFL 19 editions? Are you going to play on PC or console? Let us know in the comment section below, and don’t forget to subscribe to SGO on YouTube.